We haven't made swap projects for the Modern Quilt Guild for the last few months (here is the potholder I made for the last one, and here is the one I received in exchange), much to my dismay. I really like doing them because it forces me out of my comfort zone, and I always learn something new. This month, the guild finally assigned another swap project: Prairie Point Pin Cushions. I've never made a prairie point before, so it's definitely something new. 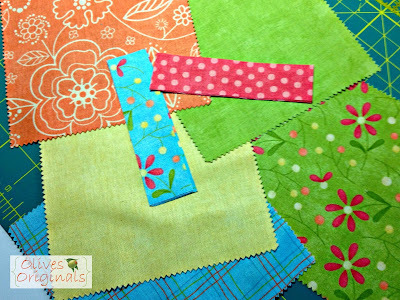 I used a collection of fabric swatches I won as the door prize of one of our guild meetings. I love how it feels like Spring. 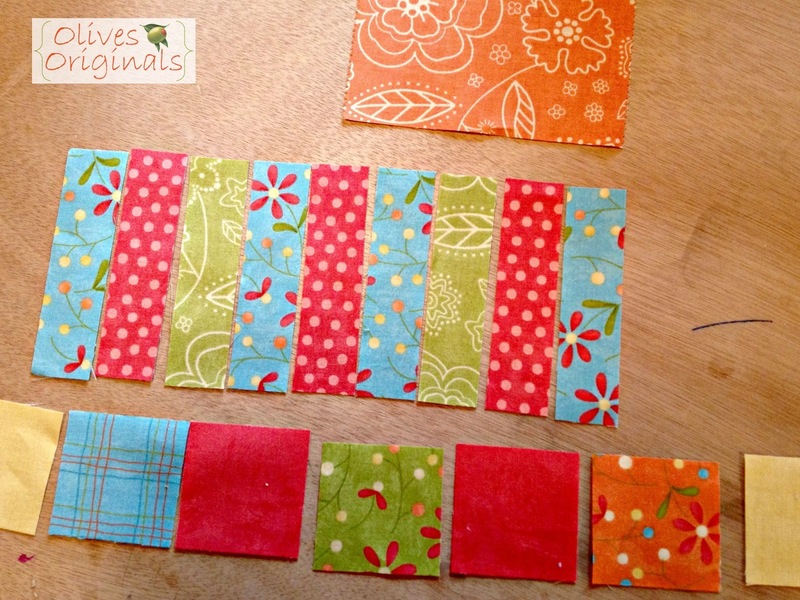 I cut nine strips 1-inch by 4-inches. 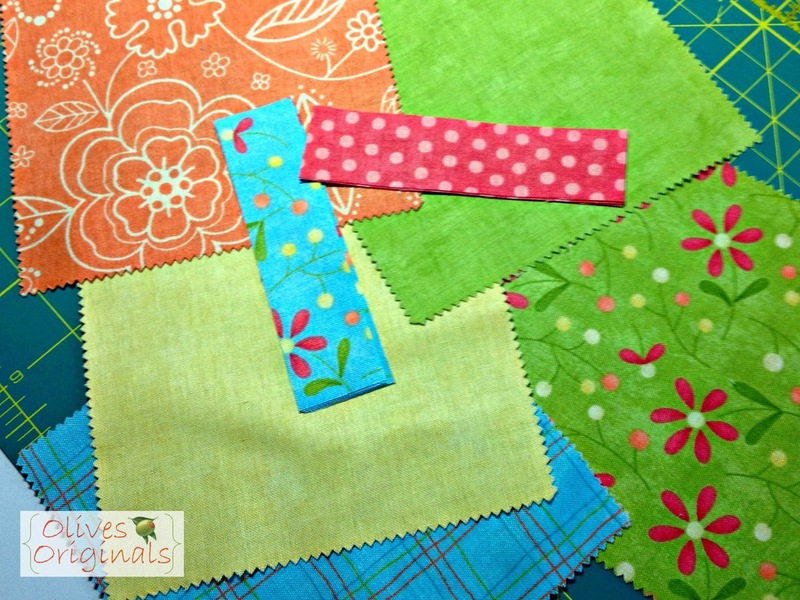 I also cut seven 2-inch squares (to make the prairie points). And finally, I cut one 4-inch by 5-inch rectangle for the back. I folded each square in half and pressed. Then I folded the corners in to make a triangle and pressed it again to hold it in place. 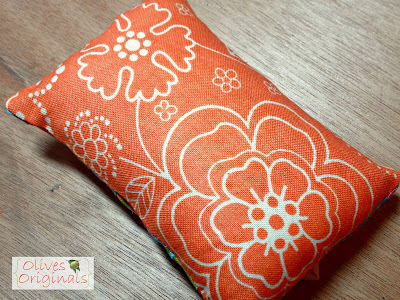 I sewed two of the strips together and pressed toward the darker fabric. Then, I laid the prairie point where I wanted it to go and pinned it in place, placed the next strip on top (right sides together), and sewed. 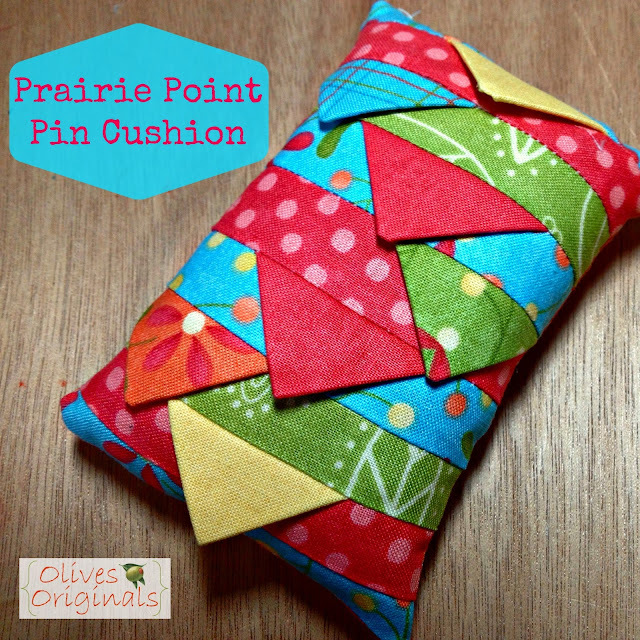 I opened it up and pressed the seam so the prairie point pointed the right way. I repeated this, alternating the prairie points (middle, left, and right), making sure to keep at least 1/4 inch away from the edge. When I finished sewing all the strips and prairie points together, I pressed it one more time. Then I placed the back on (right sides together) and sewed all the way around, leaving a two-inch gap for stuffing. I turned it right side out, stuffed it with poly fill, and hand-stitched the opening closed. I'll be swapping this pin cushion for a new one tomorrow night at our Modern Quilt Guild meeting. I'll share it with you later this week. 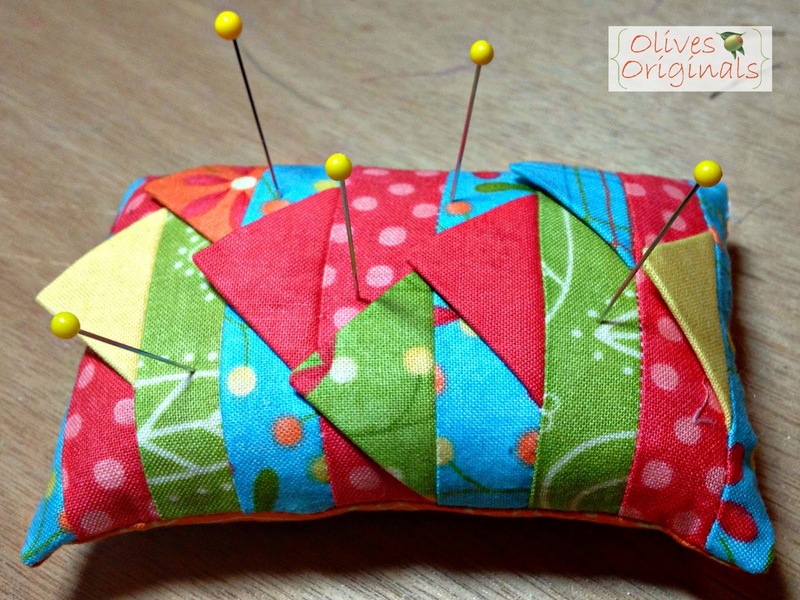 The pattern for this pin cushion came from Quilter's World in the February 2013 edition if you'd like to make one for yourself.